I have wanted to write for a very long time. I started writing when I was a teen, but it was just in personal journals that I began with: “Dear Imagination”. Now I see that and think it is rather funny. But, it was during those times of writing in my journals and studying God’s Word those many years ago, that I felt like writing was something I could do. I enjoyed writing. It made me smile, released whatever feelings I may have been having, and it just felt right. I remember one summer, after I came home from a Christian Youth Camp called Super Summer, I would sit in the quiet of my room for hours everyday, just listening to Christian music and spending time in prayer and Bible Study. I loved that time in my life. I grew so much Spiritually during that time and it was beautiful! I even remember my mom, at one time, being concerned about me because I was spending so much time hanging out in my room. But, to me, it was a place where I could meet with the Lord and be filled. Anyway, I made the devotional/journal/notebook and once I had it typed how I wanted it, 3 hole punched, and put into a small notebook, I took it to my pastor to show him. He was such an encouragement to me! He told me that I had a gift and that I really ought to try to get the book published. Well, I was a teenager! I had no idea how to do that, but he gave me some information to check into and encouraged me to run with it. He is also the one that helped me come up with the name AGOGE. I am forever grateful, and to this day I think of him as the best pastor I’ve ever had. (Not just because he encouraged my writing, but because he preached with conviction, he lived what he preached, he loved on our family, and he mentored many people into true disciples of Jesus Christ.) He is retired now, but he is still very much active in ministry. That’s the way it should be when you love Jesus! I regret to say that I never did get AGOGE published. I still have it tucked away in a file cabinet. But, I did happen to to make several copies of it and sold it for super cheap (probably the price of the notebook) to people who wanted a copy. And, it did sell. I was happy with that. I tell you all of this as background. Once I got married, and involved in Youth Ministry with my husband, my writing got put on the back burner. I was living life. I was newly married, learning ministry with my husband, and working. My creativity played out in new ways then. I LOVED to decorate homes, try out faux painting techniques, refinish things, and the like. I also worked full-time, so I just had to fit in these creative activities when I had time. And, then we began having children. Well, with one child, the creativity continued into scrapbooking, along with the previous mentioned things. But, once the second baby came, along with feeding issues and doctor visits, all came to an abrupt halt. Once we got through the difficulties, more life happened and more struggles occured. Maybe someday I can write about those bumps in my life, but those will be for other posts. I am grateful now for the struggles and bumps, even as difficult as they were, because God used them to shape me into the person I am today, and He continues to work in my life growing me into the exact person He wants me to be. Now we have 4 children, and have been married for 22 years. My husband is still doing youth ministry, but I stay at home to homeschool my kiddos (one is about to graduate this year, and my youngest hasn’t even started school yet), and life has been super crazy. However, I feel the Lord nudging me on to venture back into writing. Except this time through blogging. I’m excited and thrilled! Remember how I mentioned above the struggles and bumps along the journey my life has taken me? Well, it was through those difficult times that God gave me the thought of how my heart is on a string. It is super fragile, but placed in His hands will be held and given wings to fly above whatever circumstances come my way. And, in training and raising my children, I have the same goals for them. That I will eventually help them to cut the ties at home and be able to fly on wings as eagles. So, originally I came up with a super long blog post name. 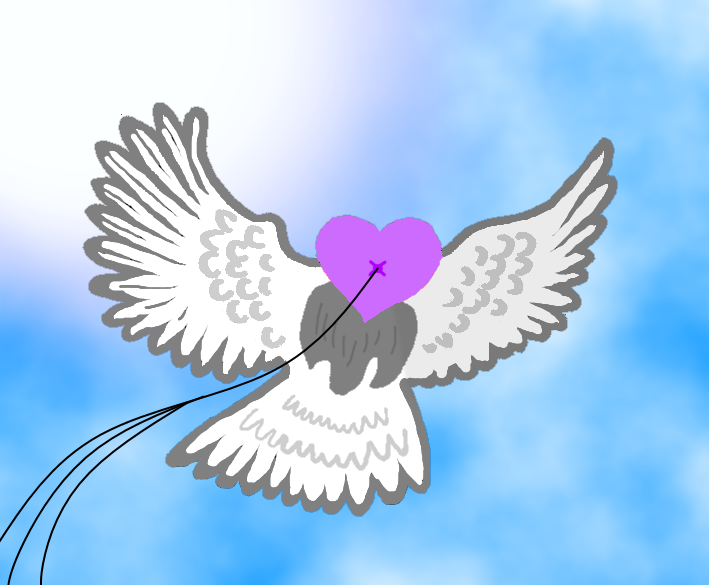 It was….Hearts on Strings Getting Wings. But, after speaking with a good friend who also blogs, she encouraged me to shorten it, as it was too long. So, I came up with Strings to Wings. We all are on a journey through this life, and all of us have fragile hearts. Hopefully when the pressures of life come and the strings get worn or cut, we will have grown enough to not fall to the ground, but to fly above those circumstances, and soar.